We, women, are the ultimate motivation for a compelling movement towards a better world. I believe that we create the course of our own reality through our voices, our questions and our choices. When we collectively come together and share the journey of these voices, questions and choices we can empower each other. As we all know this journey can sometimes be overwhelming, which is why I admire it so much. By creating sacred conversations with muses that have helped me grow and alter my personal journey, I pray that their voices, questions and choices spark some kind of enlightenment to you as it did to me. In my time living in Bali, I crossed paths with this beautiful lady at a cafe. We met around 2 years ago for a very brief moment while sharing a dinner table together. I am a person who builds her friendships depending on the energy I receive from them. Needless to say, a unique friendship came through. We surprised each other by being very aligned and in tune with our thoughts and life experiences. Sophia is a truly inspirational life muse to me. She is a friend, a wellness enthusiast, a boss lady, and an earth lover. Her energy manifests creativity, empowerment, nurturing and kindness. 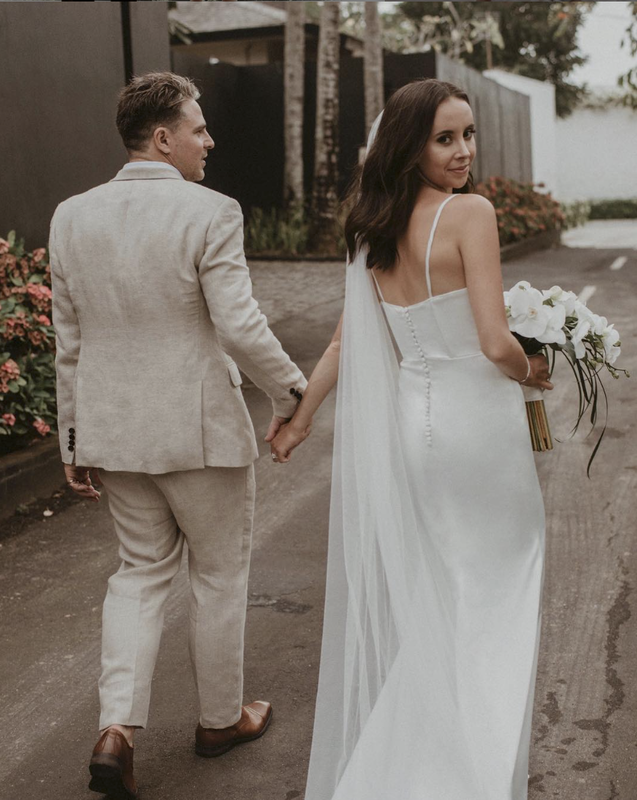 Recently after marrying her best friend (Jeremy), Sophia released her website: The Simplistic Road through a personal letter where she opens up about her struggle with anxiety and depression. Through this platform, Sophia focuses on sharing her raw and unfiltered, day-to-day experiences. Today I want to celebrate this woman for her bravery and her strength. It’s not easy to overcome such heavy weighted emotions, I say this because I am also an anxiety and depression survivor. I pray that this conversation travels to those who need it the most. Know that you are not alone and we are your friends. If you relate to anything in this conversation feel free to contact Sophia or me for any questions. This is a safe place for all women to come together, nurture, empower and celebrate each other. Where is home? And what are you working on at the moment? Home for me is between Bali and China. My husband Jeremy and I both originally from New Zealand but are based between the two places for our businesses where we work on shared passion projects in both countries together. For us both we love to be busy and are never just working on one thing at a time. Currently, I am focusing on the growth of my own online store ( Sukou Studios ) and opening our first retail store in Bali together where we will put all our brands under one roof. I am also focused on my personal project The Simplistic Road where I am sharing my raw day-to-day experiences, what works for me and my journey to better wellness and wellbeing. How has home impacted your growing up experience? Bali for me has grown me tremendously as a person. I certainly would not be the person I am today without having lived in such a healing and happy place, it's made me a better person and its changed my outlook on life. I say this because it taught me the meaning of gratitude, to give and expect nothing in return and it also taught me that no one's life is perfect there is no such thing as the perfect world, everyone has struggled in their life and that perfect is a facade, that every day may not be perfect, but there is good in every single day. Nourishment means whole foods to me. It is not low fat, it is not low calorie. It's not being hungry and feeling deprived. Its nourishing your body with whole foods so that we can feel consistently satisfied and energised to live life to the fullest. I like to eat a lot of healthy fats/omega 3s and get my sugars only through natural products where I can. It makes me feel good, and It makes me feel more balanced in my life and works well for me. How do you practice Self-Love? Why is it important to you? Self-love - If I am perfectly honest I am still working on this one. I like to practice and teach myself through trying to be present at the moment and finding time for myself. I believe it's not selfish to put yourself first we are our biggest commitments, and I like to keep in mind that I am mine before I am ever anyone else’s. In order to give others my all, I need to look after myself first. When did you realise that your body and mind needed healing? How did you start your journey of healing? I realised after coming off birth control my body and mind needed healing when I suffered from deep depression for the first time brought on by anxiety. It was an extremely debilitating time in my life where I was both physically very sick and mentally unwell. My hormones were all over the place, and I am actually still healing and balancing this months later. I started my healing journey through writing, practising self-love, meditation, and gratitude. I found so much healing in sharing my story and helping others through similar struggles. I realised just how many people experience struggles in their lives and that I was not alone. We all go through a struggle that can hurt deep. Maybe your battle or hurt is the same as mine. Perhaps it's entirely different and equally hard. I have found tremendous amounts of healing through sharing my vulnerability, by sharing my heart and by sharing my raw and honest truths about the highlights and the low points in my beautifully imperfect world! Sharing your life experiences can be the key to helping another along their journey. What message would you send to all girls? No one is you, and that is your superpower. I like to try to keep in mind that every day is a fresh start and that worrying does not take away tomorrows troubles. It takes away today's peace (something I am still learning and practising on myself). Try to fall in love with the process of becoming the very best version of yourself. No one was born perfect we are all navigating through this crazy journey called life. Not everyone will make it to your future. Some people are just passing through to teach us lessons in life! And that's the beauty of life. We are all here to learn! "Don’t compare your life to others. There's no comparison between the sun and the moon, they shine when it's their time!" I am not a big reader I have to admit, but a big goal of mine is going forward is to read more!! I love learning, and I really enjoy psychology and learning about nutrition, health and the mind. I tend to gravitate towards podcasts, I am really into listening to Joe Rogan's podcasts I find the guests and himself extremely fascinating. I love listening to a podcast on a big walk and learning about new things! It's my happy time where I can just have some time for myself. Which is so important! I know you talked about your journey through anxiety and I will share it with everyone as its very powerful and beautifully written. What called you to share your story with the world? Was it hard to put everything into words? I initially wrote my journey as a healing tool, a way to express my struggles in words to my husband who didn’t quite understand to the extent of what I was going through, he really encouraged me to share it with others suffering or going through a chapter of struggle in their life as I believe everyone in life goes through some form of stress, depression, anxiety whether its from work, a relationship, death, divorce, loss in their life. It's such a taboo topic, so if I could have been a voice to help even one person going through some sort of struggle through sharing my journey that would have made me the happiest person in the world, knowing how debilitating it can be when in the middle of. But to have been able to help so many has been truly rewarding and extremely healing in itself. Any inspirational women that you recommend on us following? I am possibly very modest, but I am mostly inspired by my friends, family and my husband who have stood by me through some of my lowest points over the last few months. They have taught me so much about a positive outlook on life and that there is no fun in perfection. You’re not going to always say and do the right things, and that's fine! You’re not here to be perfect but to be real. I think that's a really powerful message as trying to be perfect will make you sick, something I have personally experienced. One of many inspirational women in my life I would recommend following would be @lucetteromy & @madelinejoyrelph…these two incredible women who have both recently come into my life but have both taught me so much in such a short amount of time which I am in awe of. Such kindness, give, grace and most importantly that it’s okay not to be okay. I truly believe people come into your life for a reason and I am very inspired by these two beautiful souls. Last but not least, how do you practice happiness every day? I practice happiness every day through a little book called the '5-minute journal’ which my best friend gifted to me during a really low point in my life to practice gratitude. I now write down first thing in the morning when I wake up three things in my life I am grateful for. It really grounds me, and I find it to be a great way to start the day by being thankful and grateful for the beautiful life I have. I like to also keep in mind that no one can make you happy until you’re happy with yourself first and when we focus on the good the good gets better. Thank you, Sophia, for sharing this conversation with me. * all imagery comes from Sophia’s social platform.